Set in Europe in the 1600s, The Irrationalist: The Tragic Murder of Rene Descartes is an overlong but enthralling mystery. Told from the point of view of Adrien, a Jesuit sent by his church to investigate Descartes’ death. As the amateur sleuth finds a multitude of suspects, the book quickly becomes a mystery set in an unusual environment, the court of Sweden’s Queen Christina. Most thrillers are relatively short around 350 pages to keep the action exciting. 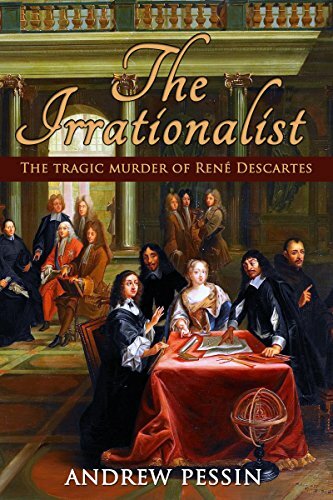 The Irrationalist: The Tragic Murder of Rene Descartes is much longer at 508 pages. Adding in all the historical details takes a few pages, I get it. However, once past the length, the story draws the reader into a different time and place. There are few books so good at making you totally forget your own problems (and occasionally to eat). In addition, you will learn quite a bit about history and philosophy though I don’t know enough to know what is fact and what is fiction. This book is highly recommended to historical fiction fans. For thriller fans, probably not as much. It would make a good public television mini-series. 4 stars! I received an electronic copy of the book from Online Book Club but that in no way impacted my honest review.